Our Mother of Confidence Who Do You Say That I Am? Our Mother of Confidence > Homilies > Deacon Jim > Who Do You Say That I Am? We don’t often think of it, but the gospels are loaded with questions. And sometimes it seems like there are more QUESTIONS than there are answers. Questions imply a quest – a search and a hunger for knowledge. That’s what Jesus like people who are in search for truth – people who are questing for God. So in today’s gospel we find Jesus asking: “Who do you say that I am?” And we find Simon Peter answering the question by identifying Jesus as the Son of God – “You are the Christ, the Son of the living God.” Evidently Peter recognized something deep within Jesus that was divine – someone coming from God. But Peter came to that answer as the result of Jesus asking him a QUESTION. Jesus – in response – sees something deep within Peter – something that PETER couldn’t see for himself. In a sense – Jesus introduced Peter to himself. “Okay,” Jesus said, “you told me who I am. Now let me tell you who you are. You, Simon, are now Rock!” (The name Peter comes from the Greek work for rock – “petros”.) This quality was NOT – I am quite sure – something that Simon Peter recognized within himself. So no doubt it was a big surprise, not only to Peter but also to ALL who knew him – and probably had NOT thought that about him. Nevertheless – he was previously known as Simon and now, because of Jesus, he was entering into a NEW self-identity. All of this was typical of Jesus. Jesus judged differently, going beyond the obvious – beyond appearances. WE judge people by appearances – Jesus judges people with penetrating INSIGHT. He went deep inside people and saw the best that was in them. And THEN He tried to get them to become aware of those wonderful qualities deep within themselves. St. Augustine once said: “Dig deep enough in ANY person and you will find something divine” – a difficult concept for us to grasp in today’s divided world. That’s what Jesus did with the woman caught in the act of adultery. He saw something in her that was far deeper than her sinfulness. Underneath her worst Jesus NEVER doubted that there was something BETTER. And when all her accusers had departed leaving her standing alone with Jesus He did not condemn her even though He recognized her sins. She must have left His presence that day with a whole new vision of who she HERSELF was. She finished that day with an entirely new identity a new name for herself a good name and a whole new person with a NEW life ahead of her. And THAT is how Jesus works with US. Put Jesus one-on-one with ANY person and He will dig until He finds something God-like – something divine – within EACH and every one of us. Then He will do everything He can to draw it out of us and into the open. We, my brothers and sisters, should do the same. Jesus comes to give us good news. The good news of Jesus Christ is not ONLY about who we really are – but who we can BECOME! The good news is this: inside EACH one of us there is the person God meant us to be. Deep within us is the person God our Father dreams we can be. There’s an identity – a name that God has given you that is nothing but GOOD. We don’t need to import anything from the outside. All of the skills and talents God originally gave us are STILL there. All of the personality traits are there. We simply need to become the person our Father always meant us to be – to bring out of ourselves the best that’s within us. Hopefully we will eventually come to see that. That’s what Peter eventually came to. But he couldn’t do it all by himself – he needed Jesus to draw it out, changing his name so that he could change his picture of himself. That is what is involved when God gives us a name in our baptism, a name and an identity that comes from God our Father – a Father who created us to be like His Only Begotten Son. For us, Jesus is the ultimate role model and he wants us to be more like Him – to forgive without limit – to trust others no matter how many times they disappoint us – to keep on loving no matter what – to keep on believing in the basic GOODNESS within others no matter how they may appear to us on the surface. We – with Jesus – should always hate the sins of others – but ALWAYS love the sinners just as much as God loves them. We need to regard THEM as HE regards you and me. Jesus calls us – EACH one of us – to live together as a family – a family that He calls His Church – a family of faith. He called it “my church” – and He declared that the gates of hell shall not prevail against it. Hell vanishes in the face of love; the devil FLEES in the face of trusting, forgiving, believing, and hoping love. Jesus knows that we can’t be our best all alone – all by ourselves. The BEST within us is always brought out in loving relationships with others. No amount of evil can ever overcome ANY amount of love. In today’s Gospel Jesus tells Simon a question; Who do YOU say that I am?” He ALSO asks US a question: “Who do you say that YOU are?” He tells Simon, “You are, Peter – rock – and upon you I will build my church. “ ” And He is saying something similar to US today – these words are written for you and me. 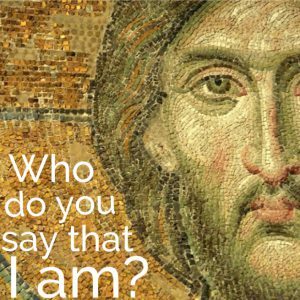 Listen to what Jesus is saying to you – and then face each day of this coming week – in the midst of our very troubled and divided world – trying to remember just who it is that Jesus says you are and who HE meant you to be.